Say this for Never Let Me Go, the new film adaptation of Kazuo Ishiguro's celebrated novel: you haven't seen anything like it at the movies this year. 103 min. Fox Searchlight Pictures. Director: Mark Romanek. Cast: Keira Knightley, Andrew Garfield, Carey Mulligan, Charlotte Rampling, Sally Hawkins. For starters, say this for Never Let Me Go, the new film adaptation of Kazuo Ishiguro's celebrated novel: you haven't seen anything like it at the movies this year. Ishiguro's dystopian, alternate-universe science-fiction melodrama gets a rendering from director Mark Romanek (One Hour Photo) that's austere to a fault. But the deliberate withholding of exposition effectively keeps those who haven't read the novel guessing, as screenwriter Alex Garland (28 Days Later...) slowly, incrementally doles out the story's secrets. The approach bonds the viewer to the leading characters, who grow up confused and frustrated in the vaguely sinister Hailsham House boarding school. Three youngsters comprise a love triangle: shyly emotive Kathy (Izzy Meikle-Small), brashly confident Ruth (Ella Purnell) and sensitive loner Tommy (Charlie Rowe), the boy in whom both girls develop an interest. Part of the poignancy of the story is the very ordinariness of this grade-school drama, set against the backdrop of powerful social forces they cannot control. These children have been isolated from mainstream society to serve a social purpose, and the reason they have been singled out for servitude functions as an allegory for the random selection of class. The audience's empathy for the characters curdles as the viewers realize they're the bad guys in this scenario: the privileged class that lives on the backs of the less fortunate. When the students move out of the school and into their adult roles, Kathy (Carey Mulligan), Ruth (Keira Knightley), and Tommy (Andrew Garfield) have developed physically but made little emotional progress. Unfair laws, a sheltered upbringing and, yet more disturbing, the sense of self-limitation inculcated from a young age socially cripples the trio, but they work to justify their lives as meaningful, if only on their own terms. Perhaps they can find forgiveness from each other for their sins of selfishness or neglect, and win redemption through self-sacrifice. Mulligan's brand of quiet suffering turns out to be ideal for the delicate porcelain doll that is Kathy, and Knightley is convincing enough as both vamp and guilty seeker of repentance. Garfield gives the most interesting performance, embodying his tender, overgrown child with awkward postures, nervous eyes and sudden, impotent rages. Together, the cast, Romanek and composer Rachel Portman lay out a terrible melancholy only made worse by the characters' naïve hope against hope. Though we may not be members of an underclass, Never Let Me Go also works on a universal, existential level, with its metaphors for how we're used up and slowly emptied out by a society that undervalues living for the moment. In facing their terrible duty, the characters come to understand that no one gets out of life alive. The filmmakers' one unforgiveable mistake comes with the film's final lines, which spell out the film's theme in a disappointing display of distrust in the audience. 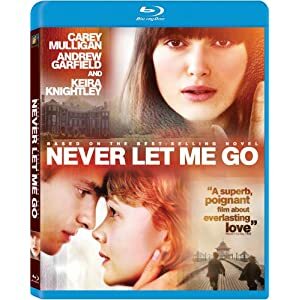 Fox brings Never Let Me Go to Blu-ray with a picture-perfect hi-def transfer that, while intentionally drab, perfectly recreates the theatrical look intended by director Mark Romanek. Detail and texture are exceptional: this image doesn't miss a trick. There's nothing showy about the lossless DTS-HD Master Audio 5.1 mix, but it's more than up to the task of recreating the film's subtle soundscape and lending full body to Rachel Portman's score: directional ambience is well handled, and dialogue is never less than crystal clear. The primary bonus feature is a fine making-of featurette called "The Secrets of Never Let Me Go" (30:10, HD): all of the principal players among cast and crew participate in interviews and/or are glimpsed at work on the production in the behind-the-scenes footage. I always appreciate a disc that provides contextual galleries, if only for completeness' sake. This disc allows the viewer to savor a variety of images about the film or displayed only fleetingly or partially obscured in the film itself. First we get "Mark Romanek's On-Set Photography" (3:13, HD) a montage of the director's black-and-white set photography. "Tommy's Art" (2:35, HD) similarly presents the artwork that figures into the story of the film. Lastly, "National Donor Programme & Hailsham Campaign Graphics" (1:58, HD) collects the graphic design work created for the film's fictional National Donor Programme. Rounding out the disc is the film's "Theatrical Trailer" (2:26, HD). Though a commentary or perhaps a featurette on the novelist would have been icing on the cake, this strong special edition should please fans of the film, particularly in its unimpeachable A/V credentials. All site content © 2000-2019 Peter Canavese. Page generated at 04/25/2019 02:46:39PM.